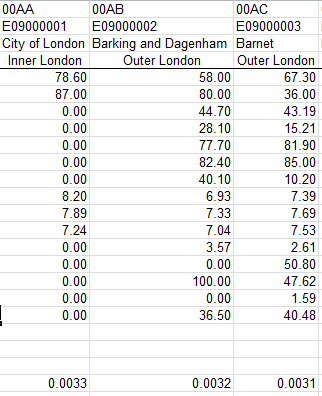 Last week’s run through the London borough data workbook directed its eponymous scrutiny at a fleet of VLOOKUP formulas in the book’s Profile sheet, ones that retrieved a trove of per-borough attributes, e.g. its migrant population and employment numbers. We proceeded to ask after the decision to draw the LOOKUPs’ index number (the function’s third argument, the one that returns the “answer” to the LOOKUP’s query) from a range wholly external to its table array. And here’s case in point number two on the problem. All of which tilts the slope towards the next question. As with the Profiles sheet we tangoed with last week, Chart-Map hangs its mapped results atop a drop-down menu comprising the seventy-or-so borough attributes on which the user can click. But it’s pipelining its core data from the Sheet1 sheet; but Profiles quarried its numbers from the Data tab instead, and it may be proper to ask why. b) Returns to the Data sheet for its lookup array – the same array Profiles used, rather than the one offered up by newcomer Sheet 1. The question, rephrased, then: why perform lookups upon two data distinct sources when only one – either one – could execute both jobs? And by corollary, we could dare to ask if two data sets – that is, Data (and we won’t make much here of its blank row 2) and Sheet 1 – are needed at all as a result. Click back and forth between the two. I am, as ever, happy to be brought into line, but I would allow that the two data sets are in effect equivalent, their difference a matter of orientation, with the boroughs beamed horizontally in Sheet 1 and vertically in Data, and with the borough attributes by extension pulling along the respective perpendiculars in the two sheets. In short, the data in the two sheets seem basically, if not completely, identical, and if so – even as I can’t claim a line-by-line vetting of all the numbers – then it’s clear that one is expendable. We’re left to wonder in turn why both have been allowed to maintain their position in the workbook. I’m just asking. Because all the data appear to be in place, I’m not certain what misgiving provoked the above formula’s search for the problem “.” in lieu of a borough’s actual population, but the misgiving seems to have been expressed; and while I’m all for leaving a spreadsheet’s formulas intact for the next person, I don’t know the contingency for which these formulas are preparing. But perhaps more to the point, couldn’t have all the formulaic toing-and-froing been overruled by a simple hard-coded, typed, references to the borough population data in the Data sheet? Those entries in the lowest row above are sequenced downwards, each succeeding borough in its column receiving a decrement of .0001 – and I don’t know why. Nor do I know what the formulas above in Sheet1 bring to the analysis that the hard-coded values below don’t. But didn’t Mr. Dylan instruct us not to criticize what we can’t understand? I’m not criticizing.